I hope you will excuse my delay in answering. I didn't have any post cards nice enough to send until I went to town and got this. School is doing nicely. Old Bob is dead. Died last Sunday. When are you coming to visit school. 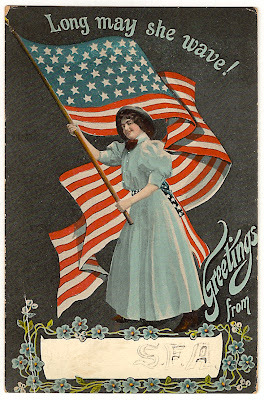 Another great postcard. Any idea what the S.F.A. on the front stands for? I must be traveling again. I see I am from Westerville OH. Close. Ingersoll, Oklahoma is very very small. Maybe she lived in this house? Old Bob would have been her dog? Sheep? Cow? Judi, I have no idea what S.F.A. means. Checking the Internet, it seems as though around 1910 it may have stood for "Sweet Fanny Adams" which meant something like "nothing at all." Perhaps this was a reference to the remote location of Ingersoll. Rob, you're right. Ingersoll is tiny now, but it seems like it was a little bigger in 1908 when it was still in the running for county seat. I'm hoping that Old Bob was some king of animal and not a person the way Mildred mentions it so cavalierly. I think the SFA stands for Society of Female Artists and is related to the women's suffrage movement that was going strong in 1908. The patriotic picture on the card lends to this theory. PS- I grew up on a farm very near Ingersoll, OK. It was tiny then. Even smaller now. At one time it boasted 7 saloons and was considered for the county seat, or so I'm told. That was long before I was born. Dear Anon, thanks for writing. When I originally wrote this information, I had not yet researched all the post cards in the collection. As I've now had the opportunity to go through more of them, I now realize that S.F.A. was short for Stella Friends Academy. A Quaker school that operated in Ingersoll and where my great-grandmother was a school teacher. 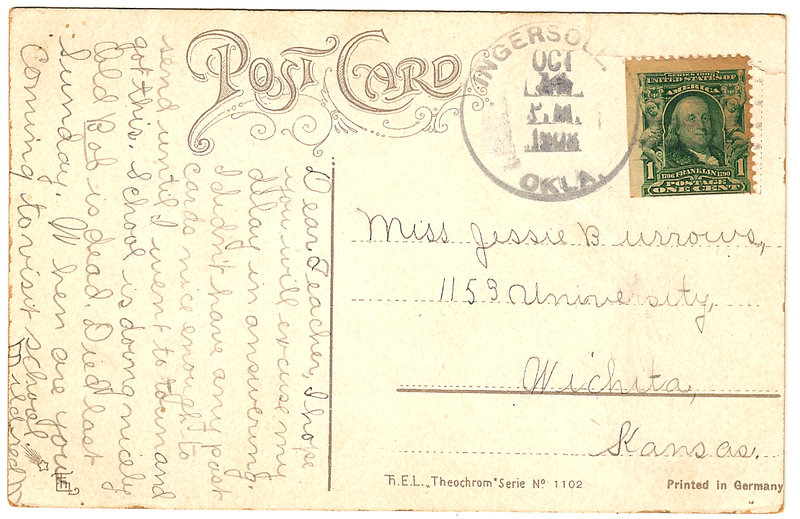 You might enjoy seeing more post cards in the collection (a number from Ingersoll) by going to the main page and clicking on the label "Oklahoma" or "Old Post Cards." 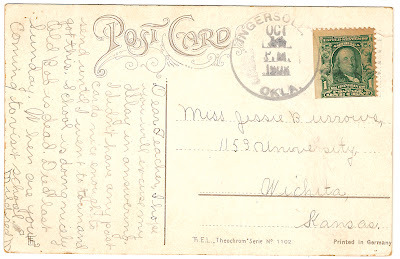 Anon, I've never been to Ingersoll, I only know of it through a series of post cards from my great-grandmother. She was from Wichita, but spent time at Stella Friends Academy in Ingersoll around the turn of the century when she was a school teacher. I live in California too, in San Luis Obispo.